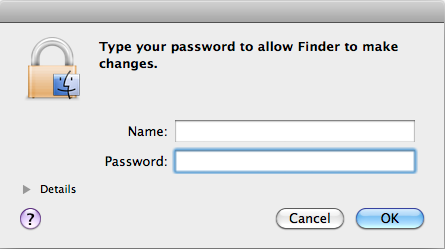 Posted on November 29, 2011, in Finder, OS X Lion, Snow Leopard, Trash and tagged ACL, ask, can't, cannot, chown, delete, empty trash, password, permissions, repair, request, trash. Bookmark the permalink. 9 Comments. Thank you for your help! I was going crazy!!!! Thanks a lot! Resetting the username works great for me. Thanks so much – this solved the problem and whats more, I understood it! you are a genius!! thank you so much for such a detailed and well explained procedure!! You saved me! Every copy action required my password…it was driving me crazy. With your help it’s finally over. Yes, I just copied and pasted the command from your post above. Now that I’m trying it again (several hours later), the list shows my .Trash permissions, and my home folder is listed after the ‘drwx’ letter string, just as you said. What if NONE of the permissions in the list are for the .Trash folder? Does that mean something is wrong, or nothing needs to be fixed?